When it comes to hotel design, elegant simplicity plays a major role in today´s upscale accommodation industry. With laying a major focus on local touches and culture. China is a rising star on the global luxury hotel chain market as I recently found out when spending two nights at the elegant and refined NUO Hotel Beijing …. NUO was founded in 2012 during an elegant ceremony held at the Temple of Heaven in Beijing. The brand intended to stir up a “fresh breeze” through the elite levels of hotels in the industry. Drawing inspiration from over 5,000 years of history and cultural heritage, the concept aims to deliver an authentic and traditional Chinese experience while combining it with high-tech and environmental friendly techniques. The design and decor are inspired by the Ming Dynasty with a wonderful combination of luxurious woods, white marble and over dimensioned vases. A color scheme that one feels automatically comfortable in. Extremely hospitable and attentive staff is positioned all throughout the lobby to literally identify guests wishes before they arise. A wide selection of contemporary art works can be found on every level of the building and you will even find a catalogue in every room that provides useful and interesting information about every piece of art displayed inside the public areas and hotel rooms. So if you wanted to and when it is raining outside, you could spend a few hours inside to take a tour of all sculptures, paintings and reliefs. The rooms and suites overwhelm with a warm and traditional ambiance and, of course, lots of room. Many technical features as well as useful details truly underline the excellent attention to detail. It might surprise at first, but German luxury hotel operator Kempinski has founded NUO with the same, or even more refined, detailed vision that itself has won its place amongst the world´s most exclusive hotel chains over the years. While today, even budget hotels attract customers mainly by sleek and stylish design concepts, in the world of luxury hotels it truly is the small details that make the difference. Like a safe that includes a power socket, lighting and a a jewelry box to adequately organize your precious things. Fresh fruits are natural as is a bottle of water which is refilled on a daily base. The water heater to prepare tea or coffee is not only a simple plastic water heater, it is a porcelain pot with beautiful Chinese patterns. Sensors activate the light inside the hallway and walk-in wardrobe automatically and make it fade again when no movement is perceived. Lighting inside can be individually controlled over multiple switches around the room, making it possible to adjust from ambient to spotlight. Bathroom amenities and toiletries include everything from a tooth-brush to a shoe mit. Not speaking of one of the most delicate scented hair and body washes around, including the ultra rich lotion. I am normally not the kind of person to take these amenities with me, but once you have used the NUO ones, you will WANT more! There is also specific bath salt provided next to the exceptional tub. Who would not want to relax here? Lying a little bit further outside the inner circle of downtown Beijing, the closest metro station Jiantai lies approximately 15 to 20 minutes walking distance from the hotel. This is the only disadvantage that the amazing NUO has compared to other accommodations situated a little more central. But for the daily life, there is everything from a supermarket, restaurants, bars and recreational parks around. So if you are not in town for sightseeing, this might even be a better choice when looking for some relaxation. Of course, there is an elegant spa and fitness area inside the premise which also includes a large swimming pool, sauna and steam room. I spent the second afternoon down there for a few hours. And even though it features everything that one is used to from a luxury hotel, I personally think that it lacks a little bit of the cozyness that the other areas inside the hotel provide. Apart from being designed in a highly modern way. Another highlight of NUO (and just recently a feature that becomes more common in current Beijing architecture) is the outdoor terrace of the bar on the fifth floor. Mainly concentrating on whiskeys, this is one of the few “rooftop” bars and currently a popular hot spot for the stylish and rich young and beautiful of Beijing. To make it short: I really, really enjoyed my stay. 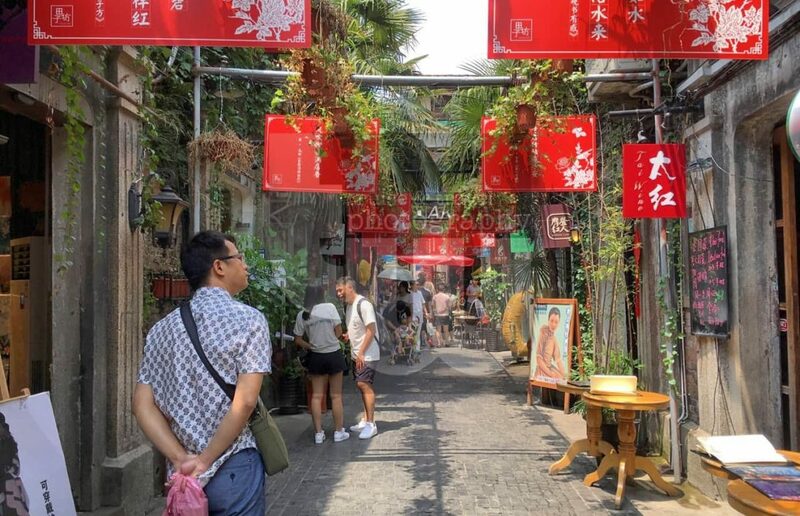 It was wonderful to combine a bit of exploration (798 Art District lies only about a 20 minutes walk North of NUO) with taking it slower than usual. Enjoying a glass of wine inside the beautiful bath tub while watching the night fall outside, taking a relaxed work out in the state-of-the-art gym, strolling through the neighborhood. All the things that I normally enjoy doing when in town, just a little bit slowed down. Perfect for a rejuvenation.